of the cave has been discovered. Exploration continues today." titled "An Ancient Maze With No End In Sight"
There are sort of two Wind Cave National Parks -- the one above-ground that we explored this morning on the trails, and the one below ground that is largely unexplored. Discovered in 1881 by the Bingham brothers, Wind Cave became a national park in 1903, the first to protect a major cave system. Over 136 miles of passageways have been mapped in the cave so far, making Wind Cave the third longest in the US and fifth longest in the world. 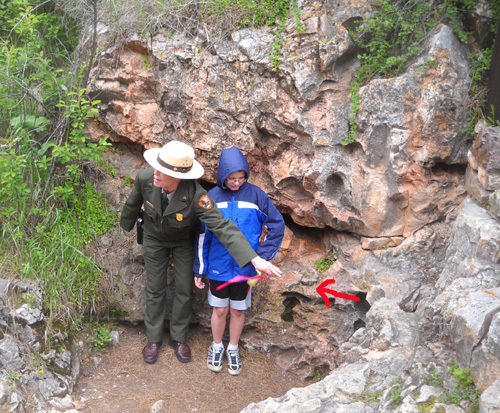 Ranger Maribeth and her helper demonstrate how much wind is coming from the cave opening. The arrow that I drew shows the direction of the wind from the hole. See how the red ribbon is horizontal from the breeze? The wind is created by differences between atmospheric pressures in the cave and outside -- and it gives the cave its very apropos name. The only natural entrance to the cave is that little hole! Wind Cave itself is the major draw at this park, so on the one full day we were here, we wanted to take at least one cave tour. That didn't work out quite like we planned, after the truck key fiasco I wrote about in the last entry. By the time we hiked an extra five miles to track down those keys it was 2 PM. Not only was time running out, so was Jim's ability to maneuver up and down the steep passageways inside the cave itself. His knee hurt, so he stayed home (in the camper) while I enjoyed one of the tours. One of the disadvantages of visiting the park outside the busy summer season is the limited range of cave tours and other ranger programs that are offered. From June 11 to August 13, 2011 five different cave tours are each offered from one to twelve times a day, for a total of 26 tours. If you schedule them right, you could do three or four tours in one day during that time period or spread them out among several days. During less busy times of the year, including this week, fewer routes are available and fewer times per route are offered. Today we had a choice of either the Garden of Eden Tour or the Natural Entrance Tour. It was 2 PM by the time we got done with the second trail loop to hunt for my lost keys. On the way back to the campground we stopped at the visitor center to see if any more tours were available this afternoon. Yes -- I could go on the Eden Tour at 3:30 PM or the Natural Entrance Tour at 4 or 5 PM. I chose the 4 PM Natural Entrance Tour so I'd have some time to take a shower and relax first. All tours are ranger-guided and leave from the visitor center. You can find details about each tour and the times they are available on the park website. Tickets are sold on a first-come, first-served basis except for two of the tours that require advanced registration (Candlelight and Wild Cave). Those are lengthier, more strenuous tours over more rugged terrain. They are limited to only ten people each and have minimum age limits. The Wild Cave Tour involves spelunking and requires hard hats, lights, kneepads, old clothes, gloves, and sturdy shoes, as much of the 4 1/2-hour trip requires crawling. Detail of known passageways from map above; there are more than this to the lower left. The Natural Entrance, Garden of Eden, and Fairgrounds tours are less strenuous but still require lots of steps down to the upper and middle layers of the cave. They cover distances of up to one mile and last 60-90 minutes. The Fairgrounds Tour is the most strenuous of the three and requires walking back out of the cave at the end; the Garden of Eden Tour uses the elevator both into and out of the cave so it's the easiest of the five tour options. Because the cave remains a constant 53 F., visitors are encouraged to wear a sweater or jacket even on hot summer days. Shoes are required on all trails -- no sandals or bare feet. The cave trails are dimly lighted and surfaces are uneven, wet, and slippery. Ceilings are sometimes low, requiring some bending. There are some handrails, but not many on the tour I took. The website and park newsletter advise visitors to reconsider if they get claustrophobic, have heart or respiratory problems, or "other physical limitations." There is a sixth tour options for visitors who have limited mobility. A few areas of the cave are accessible to wheelchairs. Photography is permitted in the cave, but not tripods. I had to delete most of the photos I took because of their really poor quality. I still use just a simple Coolpix L20 10-megapixel digital camera. Perhaps I had it on the wrong setting, but without a tripod and special lenses I couldn't get decent pictures underground. were built above the cave and there have been problems with water seeping down into the cave. 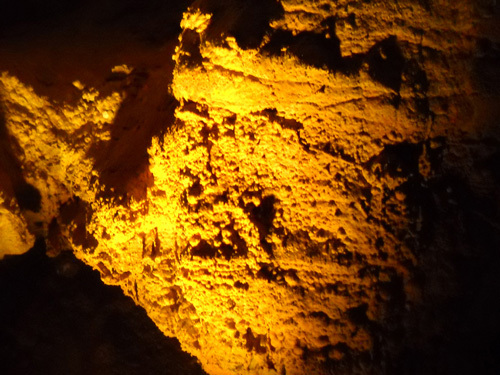 Cave tours range in price from $5.00 to $23.00 per person over age 17. Kids, and folks with NPS senior passes, get in for half price. Check the website for details. The popular Natural Entrance Tour, which I took, is $9/adult without a senior pass, and $4.50 with the pass. It's well worth either cost. Keep in mind that there is no entrance fee to this national park. The only things you pay for are the tours, camping, and/or books, postcards, trinkets, etc. that you may want to purchase in the visitor center. You can enjoy the scenery above ground, take a hike, have a picnic, watch wildlife, enjoy all the displays at the visitor center, etc. merely for the cost of gas to pass through the park. I'm interested in geology, so I'm going to include some really ancient history about how this extensive cave was formed. If you aren't interested, scroll down to the next topic (what you'll see inside). My information in this section comes from the park brochure; direct quotes are in italics. Wind Cave is one of the earth's oldest caves. Parts of the limestone that constitute the upper levels of the cave were being dissolved into passageways 320 million years ago. As ancient ocean levels fluctuated, these passages were filled with sediments. Beneath the ocean a thick layer of sediments continued to be deposited above that limestone. About 60 million years ago, the forces that uplifted the Rocky Mountains also uplifted the modern Black Hills, producing large fractures and cracks in the overlying limestone. Over millions of years, water moving slowly through those cracks dissolved the limestone to produce the complex maze of Wind Cave's passages. 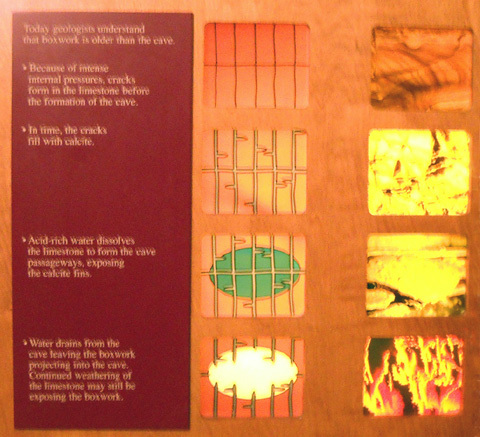 Later erosion changed surface drainage patterns, which caused subsurface water levels to drop, draining the cave passages. As the modern Wind Cave formed, many of these newer passages intersected the older filled cave, revealing the red clay and sandstone sediments from 320 million years ago (our tour guide pointed some of those out to us). 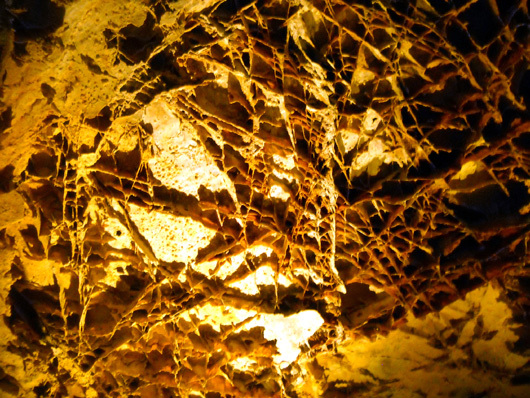 A three-dimensional network of passes formed, creating one of the most complex caves in the world. Although Wind Cave has few stalactites and stalagmites, many unusual formations and a variety of minerals are found in the cave. 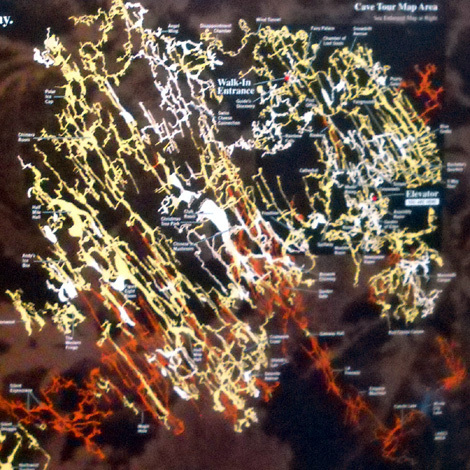 The complex geology of the cave, the profusion of boxwork, and the variety of minerals make Wind Cave a world-class cave. The boxwork I saw during my Natural Entrance Tour was fascinating. I've been in some of the country's best caves, including Carlsbad Caverns and Mammoth Cave, but I've never seen boxwork before. Very cool. My tour guide explained boxwork in terms that were easy to understand and convey to others. Imagine a house built of sugar cubes. Something has to hold them together -- mortar. If it rains, the sugar cubes dissolve but the mortar remains. That's a great visualization of boxwork. 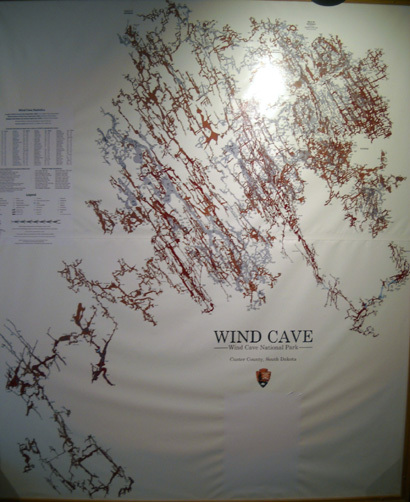 Wind Cave reportedly has 95% of all the known boxwork in the world, and very possibly more that hasn't been found in the intricate cave system yet to be explored. Wind Cave has other very interesting formations like frostwork and popcorn, chocolate-colored crystals, flowstone (looks wet, and sometimes is), formations resembling faces or animals, and chambers that inspired the names they were later given. These formations are both delicate and irreplaceable. You can guess what happened as word got out from early cave explorers back in the late 1800s about the treasure trove within this cave. When they were first discovered, streams of curious tourists were drawn to the cave. Local entrepreneurs blasted open passes and guided visitors through for a fee. Cave specimens were removed and sold. The same thing has happened to so many other natural wonders in this country. It's one of the few times I'm glad to see our government intervene. 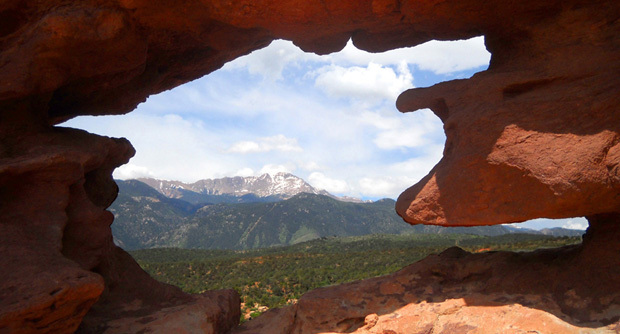 Thankfully, Wind Cave has been protected since 1903 for others to enjoy. Rangers emphasize the delicate nature of the formations in every pre-tour talk they give before taking visitors underground -- stay on the path and DO NOT TOUCH ANYTHING. The park staff has a delicate balancing act to perform -- allowing visitors to enjoy these natural wonders while protecting the very things visitors want to see. 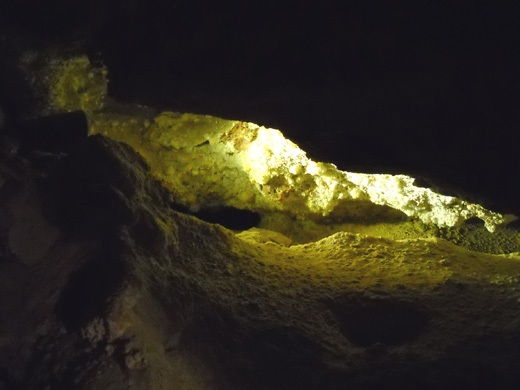 One recent improvement is replacing outdated incandescent lighting in the cave with LED and compact fluorescent bulbs. That not only cuts the power bill, it also protects fragile cave formations because these bulbs produce less heat. Water remains in the cave so crystals can grow and there is less algae. I noticed on my tour that the lights are subtle yet highlight features for which the cave is famous. I was down far enough on my cave tour that no natural light could penetrate the darkness. At one point the ranger had all of us stand still. She turned off the lights and the darkness was absolute. So was the silence (she asked us not to talk or move). That was pretty awesome. 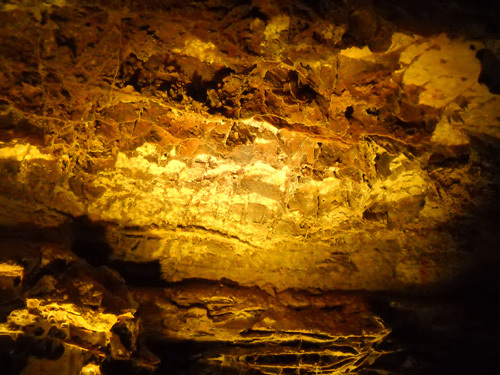 Then she shone her light on various features like boxwork in the chamber where we were standing. It was a spectacular demonstration. I was sorry when she turned the lights on again! Park staff has even more worries than protecting the delicate geological features of the cave. Wildlife is a concern, too. The park is justifiably paranoid about visitors bringing in a disease called white-nose syndrome from outside South Dakota. This disease is decimating bat populations in the eastern US. In just three or four years it has spread to 15 states and Canada, killing over a million bats. According to the park newsletter, "it is shaping up to be the largest mass mortality event in North American wildlife in recorded history." Wind Cave hosts eleven different species of bats, eight of which are cave-dwelling. The few bats seen in the cave are generally found along the route I took, the Natural Entrance Tour. Our guide quickly shone her light on a few as we passed through but did her best not to disturb them any further. Fortunately, none of the bats at Wind Cave are believed to have contracted white-nose syndrome yet. Cave managers are keeping close tabs on the situation, though. The fungus does not affect humans but humans can spread the disease from cave to cave. For this reason, visitors are asked to wear clean clothes and shoes when touring Wind Cave, and not use gear that has been contaminated with the disease in other caves. 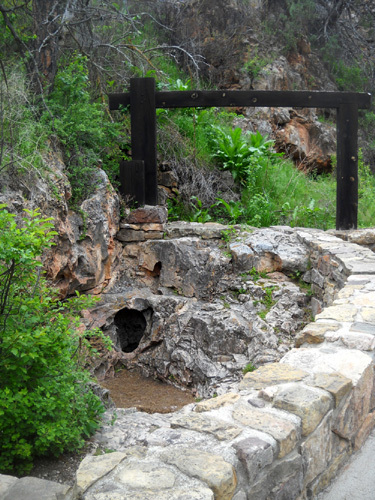 All back-country caves at Wind Cave are closed to the public. They may be entered only for management and research purposes. 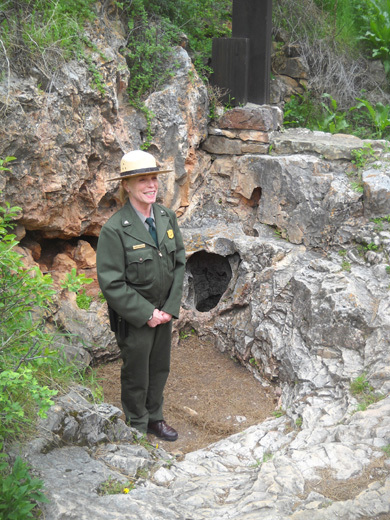 I really enjoyed my Natural Entrance Tour with Ranger Maribeth this afternoon. She's articulate, has a good sense of humor, and gave us a great tour. My group assembled in a covered area between the visitor center and cave entrance so the ranger could introduce us to the cave, reiterate the tour rules, and get us thinking about what we'd be seeing. The group was larger than I would have preferred -- about 40 people, including perhaps 15 school-age kids and teens -- but it moved along well through the passageways. I stayed near the front most of the time so I could hear Maribeth better when she stopped us to talk about cave features. Our first stop was at the only natural opening to the cave, which I mentioned above. Ranger Maribeth shows us the only natural entrance to the cave. After demonstrating how much wind comes out of that small hole, we went through a manmade entrance and gradually made our way down hundreds of steps to the middle layer of the cave about 200 feet below ground. The lowest explored level of the cave is 500 feet below the surface but we didn't get down that far on this tour. We came back up on an elevator. Maribeth used her flashlight to highlight various features inside the cave as we walked along, such as reddish rock colored by iron oxide. The LED lighting is very subtle. She turned on more overhead lighting in two places where she stopped to talk for a few minutes. I mentioned earlier that she turned the lights off for a couple of minutes. 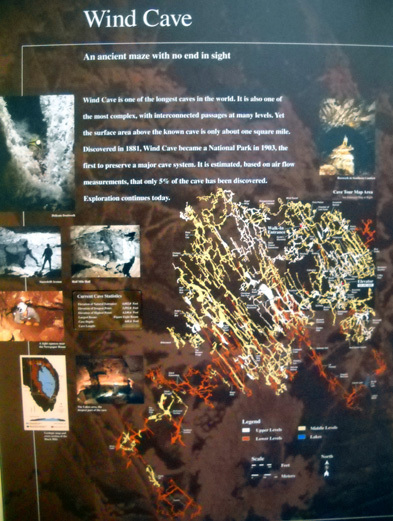 She did that to emphasize how difficult it was to explore or tour the cave before artificial lighting was installed. It is amazing how DARK it was 200 feet down when she turned off all the lights in our vicinity! The one time I ended up in the back of the pack was when Maribeth asked me to stand still at a great example of "dogtooth slag" and shine one of her flashlights on it while the rest of the group walked past me. 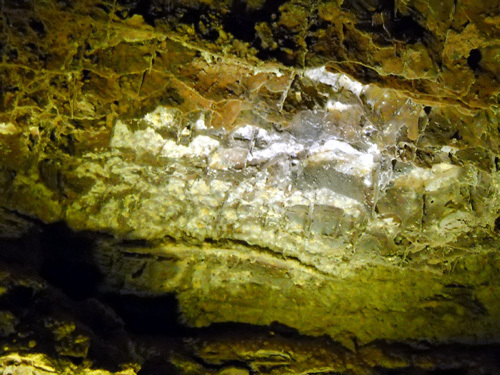 It looked like a big, beautiful geode with its crystalline features and white "dog's teeth." Unfortunately, none of the pictures I took of this feature came out well. Here's a link to a photo that does this formation justice. 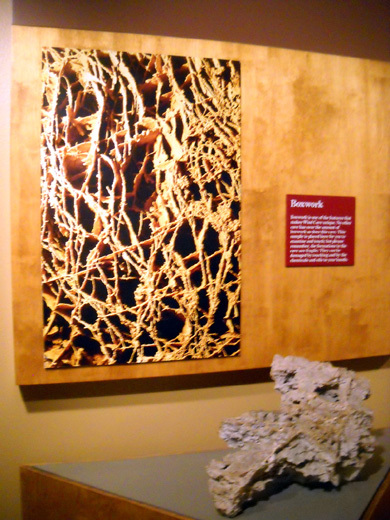 There are additional links on that page for boxwork, frostwork, popcorn, flowstone, and other "speleothems" in Wind Cave. I want to return to Wind Cave for a longer period of time(s) in the future so we can enjoy more of the trails and more of the cave tours. I'm particularly interested in the Candlelight Tour, which takes visitors to a less developed, unlighted part of the cave. Each person carries a candle bucket for illumination. The tour lasts for two hours over one rugged mile of trail. This year it is offered only from June 11 to September 5. We won't be back by then in 2011, but maybe we can schedule a visit to include that time span another year. I highly recommend visiting Wind Cave NP if you're in the Black Hills area. 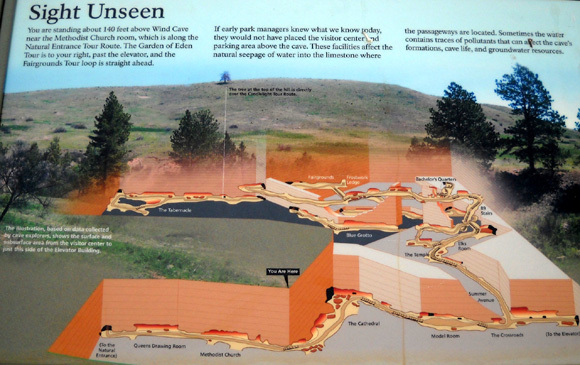 You could easily spend a week at Wind Cave NP and Custer State Park, just to the north. 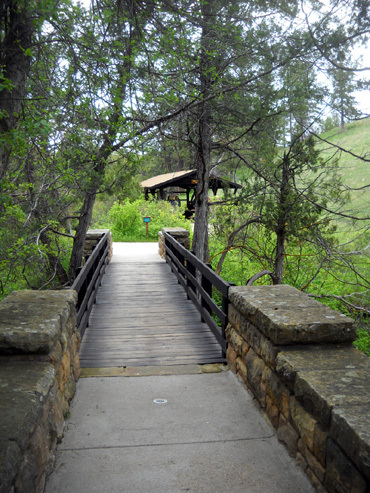 There is more lodging available at Custer SP. It also has lots of trails, bison, and interesting scenery.